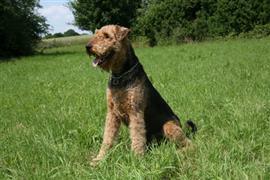 The appearance of the Airedale Terrier is a great place to start looking for names. Their worldly wise look has inspired owners to select names like Gandhi, Aristotle, and Socrates. Being the largest of the terrier breeds, the Airedale is often referred to as the 'King of Terriers'. Words in various languages that relate to or refer to kings provide a slew of clever options. A few sample name ideas are Konig (which means king in German) and Roi (which means king in French). If none of the words meaning king strike a key, why not choose the name of a king from history. William, Henry, Edward, and George are few good options coming from former Kings of England (the Airedale's country of origin). Some of our pages will contain a subcategory. A subcategory is a slightly more specific grouping than the main topic of the page. For a subcategory, we will include a separated table of names and corresponding descriptions. An example of a subcategory of Red Dog Names would be 'Dog Names Inspired by Red Wines'. If you have any subcategory ideas for the Airedale Terrier Names page, we would love to hear them. Use the form below to submit your ideas.